Mark C., an Inflow Electrical Engineer, is a big kid at heart. Before he worked as an engineer, supporting our customer’s engineering operations, he served as a Chief Fire Controlman in the Navy. Mark can be seen cruisin’ along in an old sports car accompanied by his cohort, Frankenstein, escaping an onslaught of paintballs. There are two things Mark loves: Old Cars and Halloween. He enjoys going over-the-top with his Halloween decorations and dressing up in fun costumes (as seen by his oversized, polka-dotted tie). Thank you for your service to our nation, Mark, both during your time in the Navy and now as you support our military’s mission. Stay tuned for more Inflowee caricatures as we “throwback” to our anniversary celebrations! Brittany W. is our Director of Proposals and Marketing. She’s an avid book reader and loves to work out. Displayed are some of Brittany’s favorite activities: In her hand is a tray of cookies for her love of baking, a potted plant to symbolize her garden (and by extension, the salsa she makes), and the binoculars, pink camo, and deer because she loves to hunt. 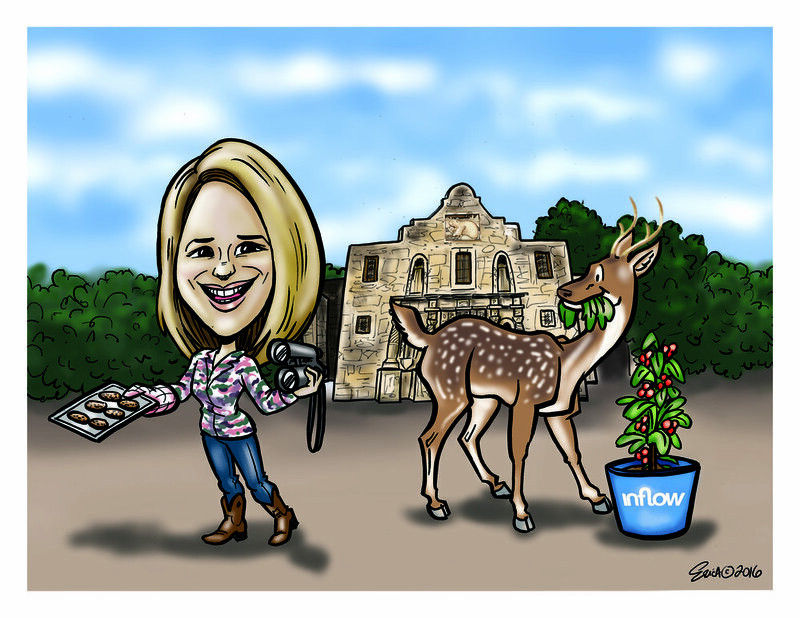 Brittany has done so much to help shape and promote Inflow’s culture.